* Norman Lebrecht to leave London Evening Standard: Arts columnist Lebrecht departs to focus on BBC Radio 3 series - The London Evening Standard arts columnist, Norman Lebrecht, is to leave the paper this week after seven years ... He said today that with a new series on BBC Radio 3 and a novel coming out next month it seemed a good time to leave - Guardian Media June 24, 2009. * The BBC has just appointed yet another arts 'supremo' to its top-heavy executive layer, but at roots level it has no clue what goes on canvas or on stage, day in, day out. Nor is it in any position to comment on unsubsidised newspapers that are forced to reduce their arts spend. 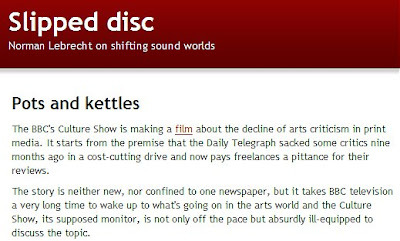 The [BBC's] Culture Show is years behind the real story and the BBC undermines its own future by such feeble and belated half-stabs at arts journalism - Norman Lebrecht, Slipped Disc, October 21, 2009.